Life is a never-ending learning process – we all know that. This especially applies for physicians and surgeons because of new medical findings and treatment techniques. To learn new surgery procedures and try different approaches to them, the Department of Anatomy of the Masaryk University Faculty of Medicine organizes anatomical preparation courses at the department since 2006. In April one of these courses – under the patronage of the “World Federation of Neurosurgical Societies” took place with international neurosurgery experts from all over the world. 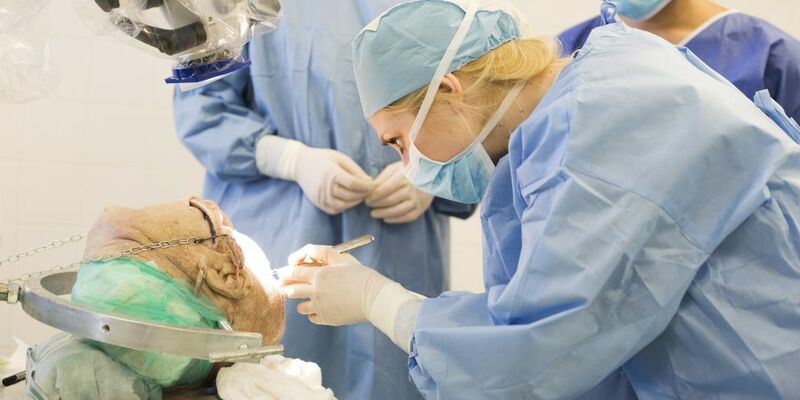 At the course in April, the participants and students could learn much about operations in the cranial cavity and were able to try out surgical procedures on anatomical preparations themselves. What is highly interesting about these courses is that the participants get a short theoretical introduction and then immediately can put this into practice on actual bodies, as Joukal explains. Beyond that, the experts and students get the chance to work in a fully equipped operating room, where they can try out certain techniques and instruments they have never tried out before, before putting them into practice on their patients. Several case studies on meningiomas or tumors that are surgically highly complicated were presented during the course. “Operations on these tumors are highly complicated and often require special access through the orbit. The participants were able to try this approach under the supervision of experienced lecturers and on preparations with color-coded arteries and veins,” explained Joukal. All in all, 25 participants could join the Czech and international lecturers. According to Joukal, the courses are in high demand. Since 2006, there are four or five courses on different topic each year. “The participants are very happy about the quality of the anatomical preparations they work with as well as the facilities of the department, which is one of the most cutting-edge in the Czech Republic and the whole of Europe,” notes Joukal. Get more information about the university here.